Who doesn’t love Karen Black? Seriously, the woman is batshit crazy and I wouldn’t want her any other way. I’ve been a big fan of hers since “Trilogy of Terror” (especially the wonderful Zuni doll story). I love that she is continuing in horror today, recently making appearances in about a half dozen horror movies every year. Seriously, no lie…check out her IMDB page, the girl is BUSY! 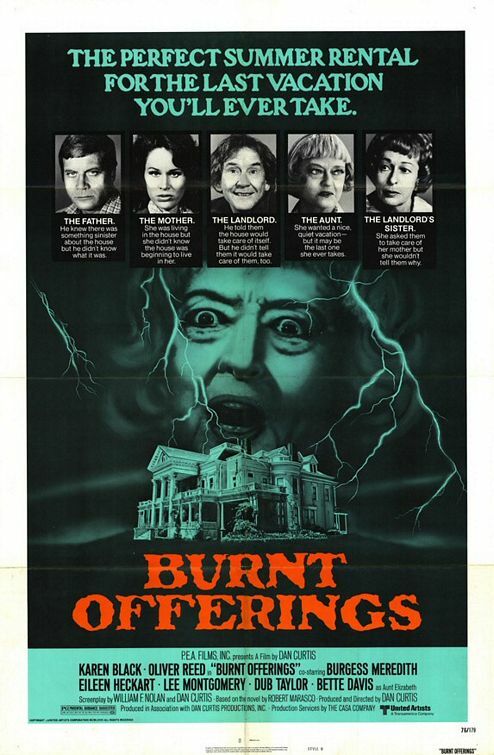 Sadly, I’ve never been all that eager to watch her 1976 haunted house thriller “Burnt Offerings.” Great cast (one cannot forget the wonderful Bette Davis as Black’s loopy Aunt) but supernatural horror has never really been my cup of poisoned tea. Nonetheless, I finally decided to film that film a whirl in my dvd player. Is it the legend that haunted house enthusiasts have been raving about? The film begins with a small family taking a vacation from the city at a large Victorian mansion in the California countryside. The family consists of Marian (Karen Black) and her husband Ben (Oliver Reed), their young son David (Lee Montgomery), and their elderly aunt Elizabeth (Bette Davis). The owners of the house are the Allardyce siblings, brother Arnold and sister Roz, played by actors Burgess Meredith and Eileen Heckart, respectively. The Allardyces appear at the beginning of the film when they inform their new tenants of a particularly odd requirement for their rental: that the Allardyces’ elderly mother continue to live in her upstairs room and the Rolfs provide her with food during their stay. The siblings explain that the old woman is obsessed with privacy and will probably not interact with them, so the food is to be left outside her door. As it turns out, this task falls to the mother who quickly succumbs to the allure of the ornate Victorian house and its period decor. Various “accidents” occur during the summer, including the suspicious death of Aunt Elizabeth. As the film progresses, Ben becomes increasingly depressed and anxious while Marian becomes increasingly obsessed with the house, the old woman in the attic, and all of the Victorian artifacts. It gradually becomes clear that Marian is somehow being possessed or controlled by the house and that a malevolent force is slowly consuming the whole family. The ending of this movie is GENIUS. Genius I tell you. Sadly, the rest of the film? Not so good. This is one of those movies in which a slow burn is confused with waiting around for an hour and a half for something to happen. Not a whole lot works here. The performances are either dull (Black and Reed) or screechingly over-the-top (Davis and Meredith) that you really don’t get a good grasp on any of the characters. That being said, the ending makes this film worthwhile. The sheer gutsiness of the filmmakers to decided to go with this dour and downbeat ending has to be commended. If you are bored you could do far worse but I don’t think this is a movie that HAS to be watched. Then again, most movies aren’t.